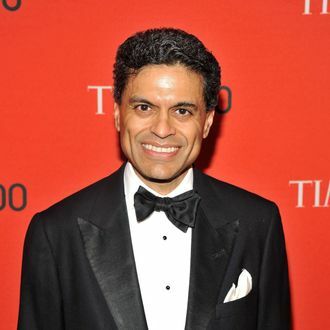 Briefly suspended Time columnist/CNN host/Washington Post writer Fareed Zakaria completed the media scandal repentance cycle today by giving an interview to the New York Times. Zakaria’s lifting of a passage from The New Yorker was determined by his employers to be an “isolated incident,” and he’ll return to most of his myriad jobs after the wrist slap, but the Times’ forgiving assessment attempts to address the how and why. By way of explanation, Zakaria went with the old “handwritten notes” line, while those around him gently suggested he may have spread himself too thin because of the changing times. The mistake, [Zakaria] said, occurred when he confused the notes he had taken about Ms. Lepore’s article — he said he often writes his research in longhand — with notes taken from “Gunfight: The Battle Over the Right to Bear Arms in America,” by Adam Winkler (W.W. Norton, 2011), a copy of which was on his desk at his CNN office. No matter what they steal, they fall back on the same excuses, as Thomas Mallon shows in his wonderful plagiarism book Stolen Words. Before the computer age, they blamed their confusing “notebooks,” where they allegedly mixed up their own notes with passages recorded elsewhere. These days, plagiarists claim they mistake electronic files of notes with their own writing. To show he’s learned a little lesson, Zakaria will cut a few of those money-making and hobnobbing hyphens, telling the Times “he plans to cut back work with groups like the Council on Foreign Relations, the Little Shakespeare Company and the Yale University governing board. He also says he plans to make fewer speeches.” But something tells us he’ll get by.